The Decimal Suite has many helpful features that make it easy for users to navigate, share data and analyze results. What aspects of the Suite assist in establishing a budget, and how is the budget documented? Many data sets and the variances between them can be displayed at any one time. The information may be presented by type of expenditure, by classifying the type of expenditure (to recreate the structure of your financial statements), by cost centre and by hierarchical structure. Managers can choose whether or not to display certain columns and also to change the order of appearance, meaning they have access to the information they need in the format they want in order to finish their budget. The following example shows a number of data sets (actual/forecast, current budget, proposed budget, requested budget) and the variances between them for the Finance department’s IT costs. Use one or more of the expense allocation tables suggested by Finance. There is no limit to the number of allocation tables that can be created. Sample allocation tables: Apply the First quarter allocation table to an account: the initial amount entered by the managers is allocated to the relevant months in accordance with the table’s parameters. Sometimes, certain accounts are the result of adding accounts with specific characteristics, such as a grant account, or an administrative expenses account, with a percentage of expenses per cost centre. The application automatically calculates these accounts to limit user activity following any number of changes to other accounts. These calculations can also be based on quantities and statistics, which can be integrated into the application. Users can add or remove revenue or expenses in batches according to various selection criteria. For example, you could increase energy account expenses by 2%, but only for the period from 4 to 7. Managers can budget at the account level or, if desired, provide a lot more details which are automatically transferred to the account level. This makes it easier for managers to justify account expenses as “other expenses.” In fact, the Finance department can require managers to enter the details of one or more specific accounts. In other words, they will be required to detail the “other expenses” (but not the other accounts). In the Details section, users can enter as many lines as required to clearly explain the account content. The Quantity and Unit Cost fields can be used to calculate the Amount field. By using the Details section, managers can avoid resorting to an external spreadsheet. This makes budget entry faster and avoids potential transcription errors. The screenshot (below) shows account details. Managers can enter the details in the lower section; the total for each period is automatically entered into the upper section. 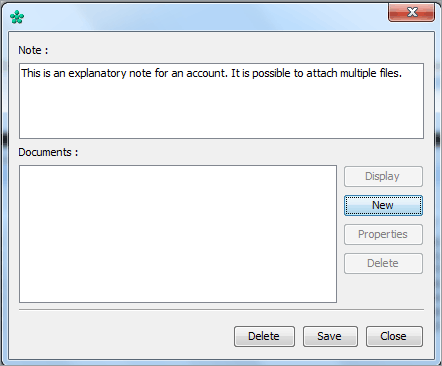 Users can provide further account details by entering notes or attaching any number of files; there is no restriction on the format or type of files that can be attached. Each account can be characterized by several alphanumeric attributes. These can be used for documentation purposes; they also enable users to analyze information from different angles, by applying filters and presenting information in reports. In the example (below), we have broken down the account number into its components but we could have chosen to enter text instead of numbers as we did in the Attribute 9 column. 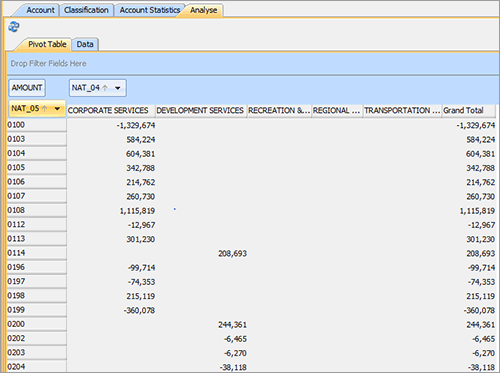 Users can create their own ad hoc analysis reports. The following sample report gives the annual result of cross-tabulating two attributes: the department number and the characterization of expense type.